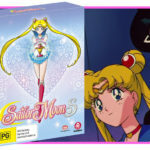 Following the recent review of Sailor Moon S on Blu-Ray, we’re back to kick off the start of the second to last series of 90s Sailor Moon in the form of Sailor Moon SuperS Part 1 – wooo! 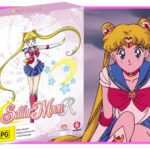 Sailor Moon SuperS Part 1 starts atypically for the 90s adaptation of Takeuchi’s classic series – random event happens (solar eclipse), bad guys appear to steal something intangible from a person (beautiful dreams), Sailor Moon and co need to stop them (twirly-twirly attacks), rinse and repeat. 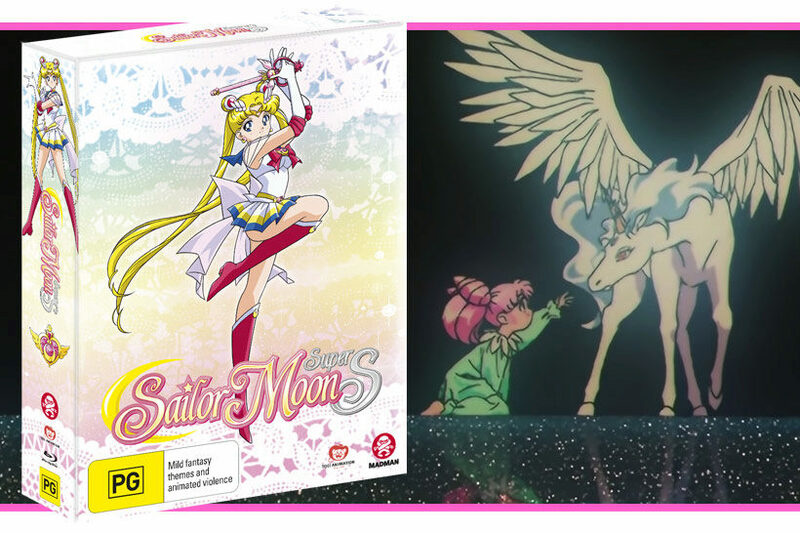 For Sailor Moon SuperS this involves the Dead Moon Circus, and in this set of episodes, everything’s focused on Tiger’s Eye, Hawk’s Eye and Fish Eye who are targeting people who have beautiful dreams because a magical pegasus might be hiding in them. The same pegasus talks to Chibi-Usa in her beautiful dreams, which leads Chibi-Usa to develop a massive crush on a horse. Yup. Like most of Sailor Moon, the premise for Sailor Moon SuperS sounds daft and inane, but in practice it’s great fun (if a little repetitive). By this point we have all the benefits of close to 130 episodes and two movies to lift the mundane into all sorts of absurdist humour and heartfelt shoujo moments. This means production values continue to be strong, just as they took a leap in Sailor Moon S, though the episodes here don’t get quite as dramatic as some of the key moments in the previous seasons. It’s great we also get two different credit sequences in this initial set of episodes too, and they’re both really solid (though the bubblegum dance/pop for Rashiku Ikimashou may grate if 90s dance music/J-Pop isn’t your thing or if you’re a terrible person). While there’s a fair whack of monster of the week in Sailor Moon SuperS Part 1, we do get a few standouts, such as episode 139 which takes a deep dive into samurai drama, and 141 where Minako gets targeted by both Tiger’s Eye and Hawk’s Eye and tries to date them both. Both of these episodes lean really heavily into the trademark slice of life element of 90s Sailor Moon but pair it with some inspired direction and animation, which help offset less interesting episodes. 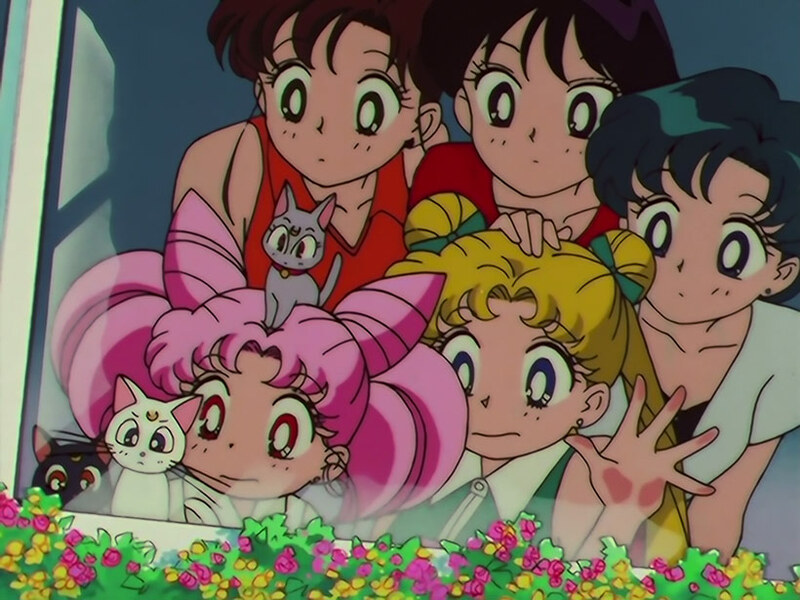 Where Sailor Moon SuperS often gets criticised is in the pairing down of its cast, and to be critical the combination of a focus on Chibi-Usa and the loss of the Outer Senshi brings with it a different pace. I wouldn’t say it’s bad as I quite like Kae Araki’s performance of Chibi-Usa, but for this latest re-watch I was a bit more conscious that the focus back on Usagi and Chibi-Usa at the expense of the other characters on the whole leaves it feeling a little less dynamic than Sailor Moon S.
Akin to Madman’s other Blu-Ray releases of the original Sailor Moon TV series on Blu-Ray, Sailor Moon SuperS Part 1 features the Japanese release’s upscaled masters and pairs it with the new English dub so we get the best of the US and Japanese releases. The restoration does a damn good job given the inherent weaknesses of the source materials, with a balanced approach to reducing noise and grain while maintaining clarity on the linework and detail in the background panels. Colour looks nice and doesn’t feel over-saturated, and on the episodes where the animation team threw in some extra love we see some really expressive work that’s easier to appreciate in the new format. 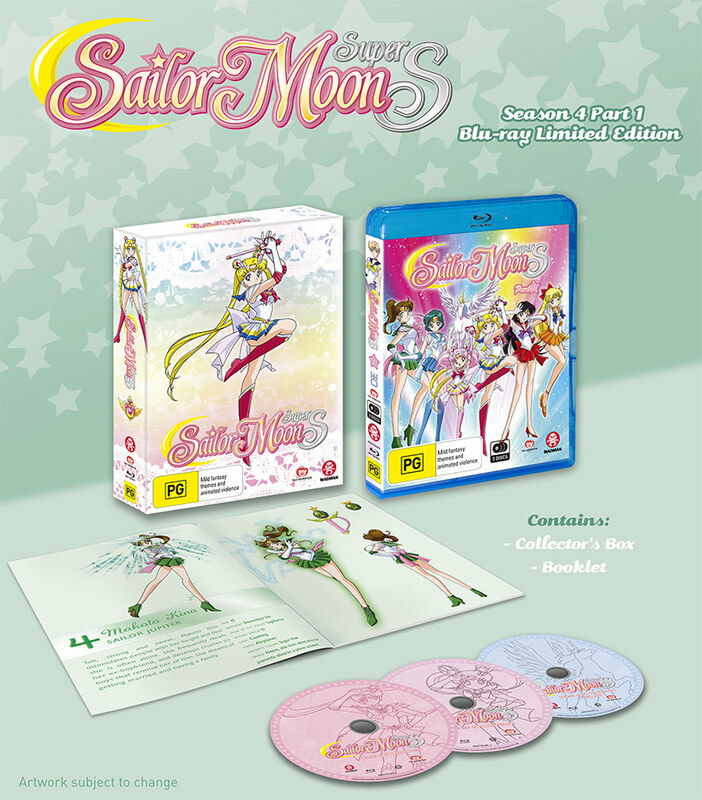 In terms of extras, it’s great to see that the Sailor Moon SuperS TV Special has also been included in the Sailor Moon SuperS Part 1 release, which features some short one-off stories set in the same timeline as the main series, one of which focuses on Sailors Uranus and Neptune (yay!). This is a great little addition given its relative obscurity, though my inner weeb is a little disappointed that the animation work on these was a little rough, though kudos to Toei for applying the same upscaled restoration on their source materials for this release. For the Limited Edition release, which we’ve been fortunate to get for review, we get a beautiful glossy hard box similar to the boxes used for the previous Blu-Ray releases with a gap filler for part 2 (when it comes out) and an awesome production art booklet printed to the same high standard as previous releases. Shiny. 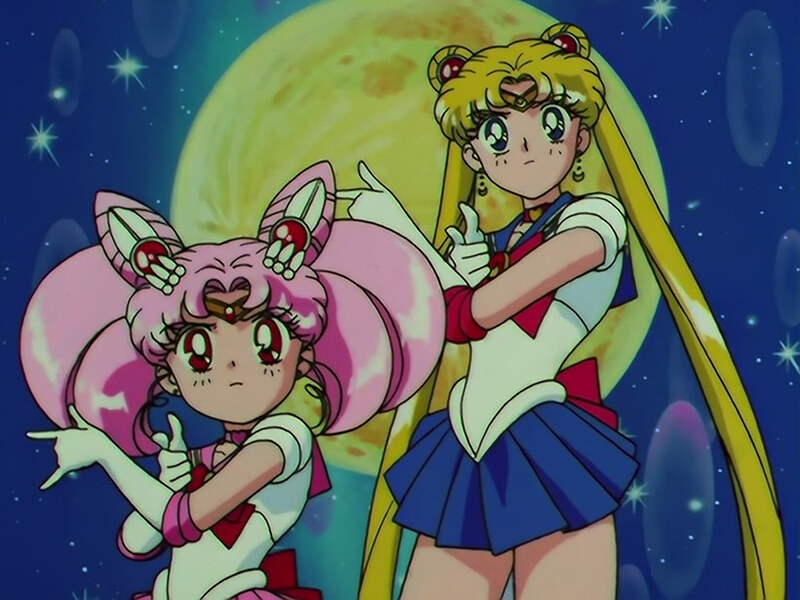 Sailor Moon SuperS Part 1 is a great start to the fourth series of 90s Sailor Moon. 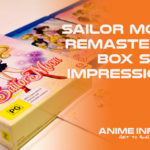 Despite some of the banality, there’s enough solid episodes here to sort out your Sailor Moon fix and the restoration is impressive given the limitations of the source materials. Part 2 should make for compelling viewing as it pushes the narrative a little harder, but it’s been great fun revisiting my misspent nerdy youth in the form of Sailor Moon SuperS! A review copy was provided by Madman Entertainment to the author for the purpose of this review.